Deep down, you probably know that both of these are not the right approach; they’re two ends of a spectrum. On one end, a manager is being way too rigid in their approach, which causes you to have an non-diverse team that may be afraid to be creative around you if it doesn’t fit “your way.” On the other side, a manager who is too flexible can be taken advantage of and may not be respected by their team. In a nutshell, this is the Leadership Paradox. Balancing when to be rigid and when to be flexible is one of the hardest things to learn as a manager. Today, we’re going to shed some light on how to handle this. As a manager, you have to decide what you will be consistent on across everyone on your team, as well as where you will be flexible to circumstance, personality, and performance. Consider these guard rails below for you to apply to the unique situations on your team. These areas below are things you cannot afford to compromise on. This side of the leadership paradox are what will define the success or failure of you as a leader, how your team perceives you, and the amount of respect you will receive. One of the worst things you can do is compromise on your values. As soon as you do, their meaning is lost. It’s the difference between people proudly looking at the values on the wall at your company and laughing at them. So how do you live your values? It’s who you hire, who you fire, and who you promote. It’s what you reward and praise (you’ll see more of that), as well as what you condemn and correct (consequences mean you’ll see less of it). When your actions reinforce what you say, you will be respected and your team will act as you do. When you fail to set the right example, they will see you as a hypocrite and you aren’t likely to see the results you hope. It’s easy to get bogged down in week to week and month to month execution. Before you know it an entire review cycle has gone by and none of your people have grown. Their skills are largely the same as before and they’re no closer to the promotion they aspire to. Or in some cases you do invest in people’s growth, but only some people on your team. It’s easy to put time in with your star players; they learn quickly and are hungry for new challenges. They’ll likely force the issue for you if you don’t, so it’s hard to forget to help them. It’s also easy for your lowest performers to consume a lot of your time to get them to acceptable performance. Both are worthy endeavors, just don’t forget the middle group in your team. It’s in raising the bar for everyone on your team that you have the most success. It’s an important, healthy conversation to talk to everyone about their goals. If you’re looking for helping talking about people’s skill and career growth this post and this one can help. No matter the experience level or tenure of someone on your staff, you need to have one on ones with them. They’re a time to fix problems, give and receive feedback, talk about their career growth, coach them, and more. If you don’t set aside that time regularly to cover these topics in a one on one, you’re unlikely to talk about them at all. 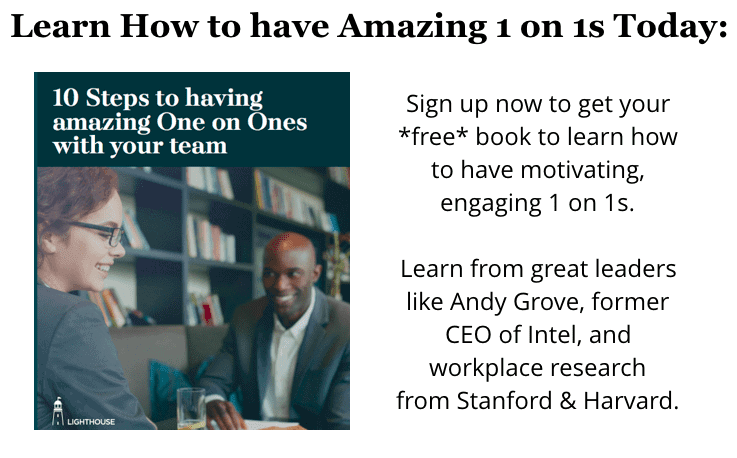 Not taking advantage of the power of one on ones for everyone on your team is a huge loss as these conversations impact their morale, motivation, and quality of their work. 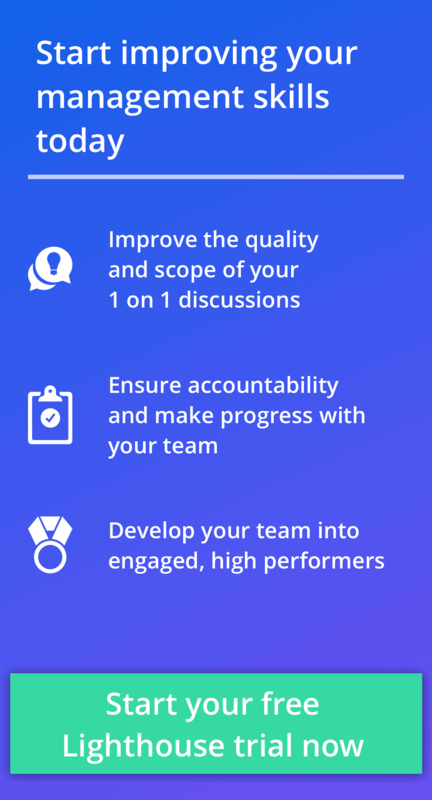 While each person’s one on one will be a bit different in style and topics covered, it’s essential that everyone on your team has them if you want to be a good place to work. When there are little to no consequences for bad behavior or broken promises, not only will the undesired behavior not stop, it is likely to spread. When others see what someone else can “get away with” they’re likely to try themselves. Good team members will also get frustrated, affecting their performance. For accountability to be an asset for you, it must be consistent. No one respects double standards, and your most challenging people to manage on your team will always be looking for where you set the bar. If you hold the bar high, they will perform well, but if you lose accountability, their performance will be the first to slip, and others will soon follow. Being a manager is not just about being rigid; you have to know when to be flexible and not use the same approach every time. This is the other side of the leadership paradox. The key is adaptation. You have to recognize where you need to adapt to the current situation, person, or opportunity. When you do, your team will flourish and succeed. 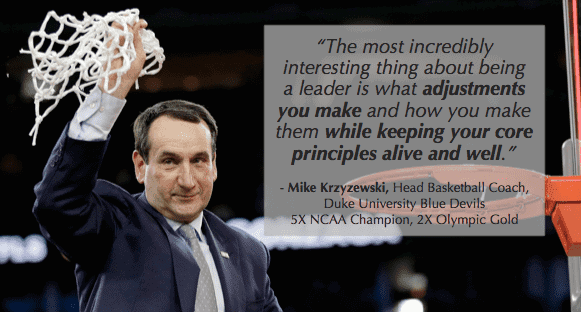 Coach Krzyzewski’s last championship in 2015 was a perfect example of consistent inconsistency. He kicked a player off the team for violating team rules, while adapting to multiple injuries to make a small, 8 player rotation work against the best teams in the country. He was consistent on his values, while being inconsistent on his strategies and coaching approaches needed to win. Below are areas you should be flexible on and adapt to as you manage and lead your teams. While you need to consistently invest in the growth of your people, how you do it should vary person to person. Some people are hyper-aggressive and will want to advance up the ladder at your company quickly. They may need more hands on mentoring, and be hungry for multiple ways to learn skills like books, training, and special projects. Meanwhile, others may enjoy their current role and would like to go deeper in their existing skills. The best way to help them grow may be via the projects you assign to them, or what more senior people you have them work with. Finally, others may not be hungry to grow at a given time. Sometimes it’s a lack of motivation or not knowing what their goals are. Other times, there can be personal reasons. For example, if someone is about to move their family across the country to change offices they work out of, that’s probably taking their focus temporarily away from growth. In these cases, it’s best to be flexible on when you talk about their goals, or in helping them experiment with potential goals before a long term commitment to one. By adapting how you help each person on your team grow, you’ll show you’re invested in their growth and success no matter their goals or circumstances. Everyone on your team will not respond to the same efforts the same way. For example, introverts often want more time to consider an idea before discussing it privately, while extroverts have no problem giving immediate reactions in a large group setting. If you manage in a way only one type of person responds to, you will not being getting the best out of everyone on your team. You may also then only attract a certain kind of team member, losing out on the benefits of a diverse team. One simple example you can apply this idea to is with your 1 on 1s. Some people may prefer getting out of the office, which could mean going to a coffee shop, or just taking a walk. Others may prefer a more formal meeting in a conference room. Adapting your approach to fit where they’re most comfortable will make your meetings more effective and show you care about them uniquely. As psychologist Abraham Maslow said, “if all you have is a hammer, everything looks like a nail.” If you approach managing and motivating your team only one way, don’t be surprised if not everyone on your team responds to it. Take the time to get to know your team and pay attention to what each person uniquely responds best to. Trust is earned. The better someone performs and the more they meet your standards, the more you can give them freedom in their work. If you’ve seen someone deliver repeatedly on a certain type of project, you can likely ease off on the number of check-ins before the completion date (though you should never stop them entirely). Some managers are laid back and some are hard driving. Unfortunately, doing either all the time will negatively impact the long term performance of your team. The laid back manager may find their team regularly missing deadlines and not taking important issues seriously. Meanwhile, the hard driving manager will drive their team right into burnout (or worse) if they never let up. “An overtired artist drove to work with his infant child strapped into the backseat, intending to deliver the baby to day care on the way. Some time later…his wife happened to ask him how drop-off had gone – which is when he realized he’d left their child in the car in the broiling Pixar parking lot. The two most important ways to gauge how hard to drive are the importance of a situation and the state of your team. If everything is an emergency, then nothing is. Take the time to gauge when you really need to drive hard and when you can treat your work like the paced marathon that work is. While you’re balancing when to push hardest, you also have to watch how your team is feeling. Especially after hard sprints, it’s important to give your team time to recover. One of my mentors has told me that after his engineering team delivers a big project, he makes sure the next set of tasks are light. He’ll sometimes also schedule a hackfest to help restore their creative energy on fun, short term projects that they choose. This ensures he never burns his team out. Do you balance how hard you push your team? Do you recognize when your team members need to recover? Especially when you transition from an individual contributor to a manager, it can be hard to give up control of your past work. However, micromanaging your team members will demotivate them and stifle creativity. You must trust your team and give them ownership of their work. You want to hold them accountable to the results you agreed upon, while being flexible on how they get there. 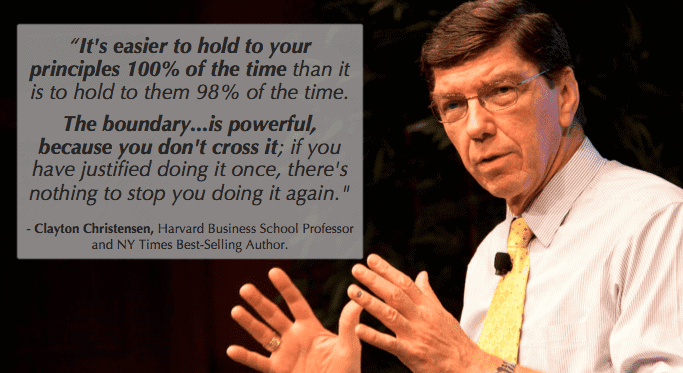 The common fear that stops most managers from doing this is the fear of making mistakes. You have to let your team members fail sometimes. That’s how they learn and grow. The key is to recognize what failures are okay, and which are not. “The waterline principle means that it’s ok to make a decision that might punch a hole in the boat as long as the hole is above the waterline so that it won’t potentially sink the ship. But, if the decision might create a hole below the waterline which might cause the ship to sink, then associates are encouraged to consult with their team so that a collaborative decision can be made. By recognizing which risks are safe to take alone and which are not, you can give your team more autonomy, while making failure safe. Both will help your team flourish and grow, while ensuring you avoid any catastrophic problems. No one said managing your team was easy. However, if you understand how to balance this leadership paradox, you will be on your way to leading your team well.